Is Dyscalculia a Genetic Disorder? Dyscalculia and dyslexia are often grouped together, but they aren't the same thing! While dyslexia is more a problem with reading, grammar, and English, dyscalculia is instead more a problem dealing with mathematics. For example, children diagnosed with dyscalculia wouldn’t know whether if 9 is bigger than 1, or if 2 is bigger than 4. One thing scientists disagree on, though, is the matter of genetics. For a while, scientists believed dyslexia was more of a genetic disorder, while they believed dyscalculia developed over the years. How is #dyscalculia related to genetics? This video, however, delves into studies showing dyscalculia potentially having a genetic link, affecting young children at birth. Some studies have shown a link between dyscalcula and other genetic disorders, such as Turner syndrome and spina bifida. That said, while there is no cure or even preventative measures for dyscalculia or dyslexia, there are numerous programs available to help teach children with these disorders properly. With these programs, diagnosed children now have the same learning opportunities as undiagnosed children! 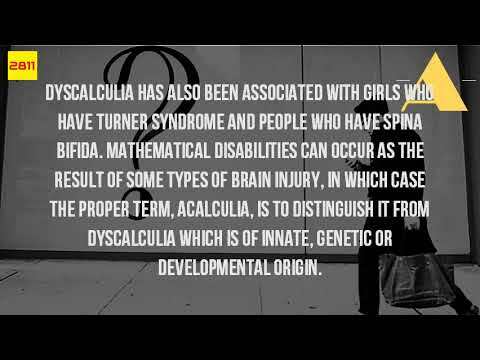 Dyscalculia has been associated with girls who have Turner syndrome and people who have spina bifida. Dyslexia and dyscalculia have both been theorized to be genetically-linked disorders. Dyscalculia, which affects mathematics, has no cure or ways to prevent it. There are numerous programs to help teach children with these disorders properly. Video of Is Dyscalculia A Genetic Disorder?